The Ivanhoe, captained by William Edwards, arrived at port of New York from Liverpool, England, on May 10, 1848. The Ivanhoe was one of dozens of ships that carried thousands of immigrants to America in the late 1840s. The breakdown of passengers on board the Ivanhoe is as follows. Irish: 174, English: 169, Welsh: 32, Scott: 5, Other: 8, Total: 388. There were ten (first) cabin passengers, thirteen second cabin passengers, while the bulk of immigrants (358) traveled steerage class. A variety of occupations were represented by those on board. They included, doctor, lawyer, school master, blacksmith, miner, farmer, brick layer, engineer, shoe maker, milliner, lace maker, weaver, hair cutter, printer, cartwright, and missionary. Most of the individuals who traveled as cabin passengers were listed as merchants, gentlemen, and ladies. Follow this link for a scan of the first page of the Ivanhoe's passenger manifest. Many of the immigrant ships departing Britain in the late 1840s carried Irish immigrants who were fleeing the deadly potato famine that would eventually kill millions of their countrymen. Given the date (1848) and with 174 Irish passengers on board, the Ivanhoe definitely qualifies as one of the so-called "Irish famine ships." 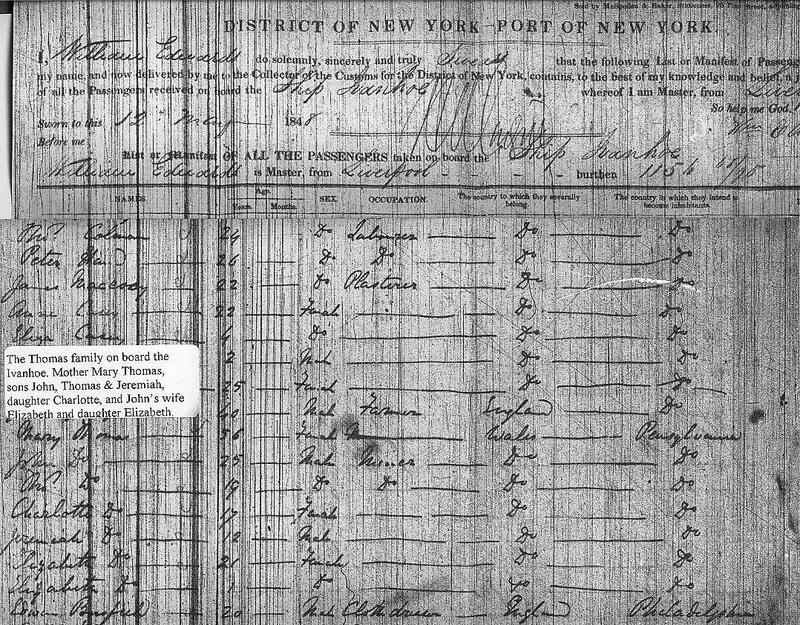 Mary Thomas (my great-great-great grandmother), her children John (my great-great grandfather), Thomas, Charlotte, and Jeremiah, and John's wife Elizabeth and their baby daughter Elizabeth (page 8), were among only 32 Welsh passengers on the Ivanhoe. The Thomas family was heading to Hyde Park/ Scranton, in Lackawanna Co., Pennsylvania, where John had secured work in one of the area's busy coal mines. Follow this link for a look at the Thomas family on board the Ivanhoe. 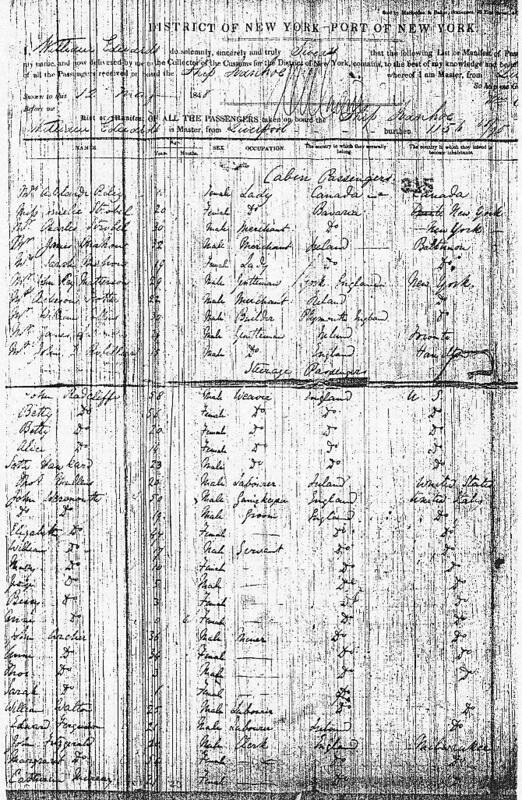 Below you will find a complete transcription of the Ivanhoe's passenger manifest, filed by Captain Edwards with the Port of New York on May 12, 1848, two days after the ship arrived in port. The nine-page list is presented in order. Some of the names and occupations of the passengers are difficult to read, and these entries are accompanied by a question mark (?). The Ivanhoe's manifest can be found on microfilm at the National Archives in Washington D.C. I, William Edwards, do solemnly, sincerely, and truly swear that the following list or Manifest of Passengers subscribed with my name, and now delivered by me to the Collector of Customs for the District of New York, contains, to the best of my knowledge and belief, a just and true account of all the passengers received on board the Ship Ivanhoe, whereof I am master, From Liverpool. List or Manifest of all the passengers taken on board the Ship Ivanhoe, whereof William Edwards is master, from Liverpool - - - burthen 115h tons. James Chalk 27 M Carpet Weaver England U.S.
William Storm 44 M Farmer England U.S.
Anne Storm 40 F England U.S.
William Storm 18 F England U.S.
John Pugh 25 M Carpet Weaver England U.S.
William Ellis 22 M Miner England U.S.
Johnson Williams 20 M Miner England U.S.
Thomas Ogden 26 M Laborer England U.S.
Alice Ogden 27 F England U.S.
John Ogden 22 M Laborer England U.S.
Richard Yates 22 M Laborer England U.S.
Mary Davis 50 F England U.S.
Priscilla Davis 13 F England U.S.
Anna Davis 3 F England U.S.
Thomas Dinner(?) 20 M Engineer Ireland U.S.
Patrick MacCormick 22 M Blacksmith Ireland U.S.
Margaret MacCormick 18 F Ireland U.S.
Bridget Culey(?) 13 F Ireland U.S.
Edward McDermott 25 M Laborer Ireland U.S.
William Beattie 23 M Grocer Ireland U.S.
Andrew Smith 27 M Laborer Ireland U.S.
Pat Smith 25 M Laborer Ireland U.S.
James Riley 30 M Laborer Ireland U.S.
John Doyle 26 M Laborer Ireland U.S.
Bridget Brady 20 F Ireland U.S.
Bridget Brady 19 F Ireland U.S.
Catherine Brady 18 F Ireland U.S.
Ellen O'Riley 20 F Ireland U.S.
Anne Dunnanrey(?) 14 F Ireland U.S.
Owen Donnely 20 M Laborer Ireland U.S.
John Tierney 20 M Blacksmith Ireland U.S.
Thomas McCabe 15 M Laborer Ireland U.S.
David Tophan(?) 38 M Spinner U.S. U.S.
Mark Sally(?) 30 M Laborer Ireland U.S.
Elizabeth Sally 24 F Ireland U.S.
Hugh Sweeney 25 M Laborer Ireland U.S.
? Sweeney 14 F Ireland U.S.
Peter Sally 32 M Laborer Ireland U.S.
Jane Sally 20 F Servant Ireland U.S.
James Sally 26 M Laborer Ireland U.S.
William Hilton 47 M Silk (?) England U.S.
James Hilton 22 M Hair Cutter England U.S.
Richard Oliver 21 M Weaver Wales U.S.
Sarah Evans 24 F Wales U.S.
Mary Nichols 23 F Wales U.S.
Henry Savage 23 M Painter England U.S.
Martha Savage 23 F England U.S.
Henry Savage 10m M England U.S.
Thomas Parsons 26 M Missionary England U.S.
Elizabeth Parsons 25 F England U.S.
John Heney 20 M Laborer Ireland U.S.
Owen Meagalum(?) 40 M Laborer Ireland U.S.
Benjamin Rogers 24 M Sawyer U.S. U.S.
Elizabeth Rogers 45 F England U.S.
Henry Rogers 5 M England U.S.
William Stanage(?) 30 M Sawyer England U.S.
Caroline Stanage 25 F England U.S.
William Magne 40 M Frame Smith England U.S.
Barnard Campbell 20 M Farmer Ireland U.S.
Patt Fray 21 M Farmer Ireland U.S.
Robert Waugh 46 M Shepherd Scotland U.S.
Mary Waugh 34 F Scotland U.S.
William Waugh 1 M Scotland U.S. In the Second Cabin and Steerage 371 Adults 1 of which ? and infants under one year of age.